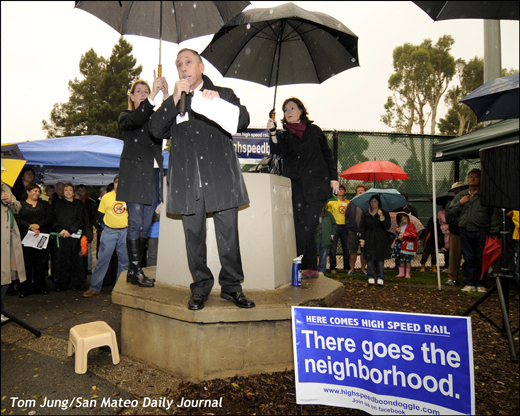 November 7, 2010: San Mateo City Council member Robert Ross addresses a rally to raise citizen awareness of the negative impact the California High-Speed Rail Authority’s plan will have on peninsula residents. The protest occurred on Sunday, November 7 in Washington Park across from the Burlingame Train Station. It occurred to me that two issues could be addressed in today's posting. Normally I limit myself to a discussion of the technical aspects of the image, or what went into making the photograph. But there is a second issue, one that addresses the reason for why the photograph exists in the first place. While we may assume that a picture (or photo) is worth 1000 words, a photo presented in a journalistic venue must tell a story. It is the job of the photographer to highlight those visual elements that add to the viewer's understanding of the event, and minimize (or eliminate) those that detract from the message. This post will start wit the technical backstory for this post and will be followed by some opinions about the photo’s success. Rain, Rain, Rain: Shooting in the rain happens. I don't like doing it, but you can't change your mind once you're committed to take an assignment. This photo was made early in my "career", and at the time I was anxious to prove myself as a "do-anything, go-anywhere photographer" so long as I could stay within my equipment's comfort level. When using a shoe mounted speed light, you will need to prevent water from shorting out the hot shoe connection. Nikon makes a water guard, a rubber skirt for the D300 / SB-900 combination that discourages water from entering this junction. I had one, and used it. Luckily for me the rain was light and intermittent, and my parka provided sufficient protection for the camera from the elements. Had it been a real downpour, it would have placed the camera in a plastic bag so that the lens hood protruded from the opening. A little gaffer tape and the camera is safely sealed within. Oh, and be sure to use black gaffer tape. Silver "duct tape" looks so Red Green. And be thankful this is the digital age, which means no film changes, focusing, or fussing with any adjustments. If I couldn’t find a bag big enough for an on-camera speed light, I could have installed a Calumet Wireless Transmitter in the hot shoe and the matching receiver on a hand-held speedlight in its own plastic bag. Simplicity was the word here. You really can't get too fancy under situations like this. I wasn’t Joe McNally, after all. This meant that I worked alone with nobody to install my lenses, hold my speedlight, or get me a cup of coffee. I might have been able to mount said receiver / speedlight combination on a monopod, covered with a bag, and achieved an off-camera lighting solution. But when working alone in a crowd, you just don’t have the extra arms and hands to experiment with off-camera lighting solutions. To make this shot, I used an SB-900 mounted on a D300 with a 12-24 Tokina wide angle lens. It was a straight shot without any compensation for exposure. With the Open Shade white balance preset, the speedlight fill would probably appear a bit warm, but since the faces represented a very small portion of the image area, you probably couldn't tell one way or the other. The flash head was angled high and to the left to decrease the amount of direct light on the sign in the foreground. The photo is three dimensional, with details from front through the middle and back to the rear. The foreground sign is easy to read and gives the reader a clue as to what is going on. The subject plane is composed of three figures, all with faces clearly visible. They are close enough to the camera to be recognizable. The background audience lets the viewer know this is some sort of protest. The umbrellas held by the two assistants help to frame the main subject. There was nothing I could do about the umbrella that appears at the top right edge of the photo, but the two above the main speaker help the viewer understand why it is there. There wasn’t much more I could do, since I was already at my widest setting, and with a crowd behind me, had no place to go. I believe that this photo met all the criteria to qualify as proper photo for the venue. It's pretty straight forward, and the intent clear. It was the 13th image I submitted to the paper and was made in the first six months of my "internship". I was just starting to grasp the nuances that contribute to a good photo, and I'm still learning.